... There is still a lot of activity in and near the crater. 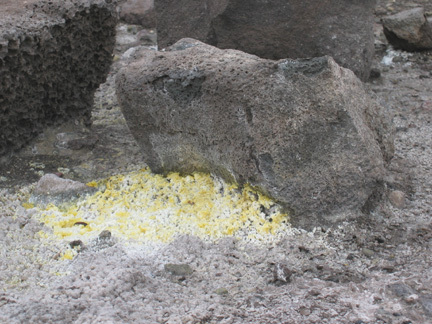 The volcano emits lots of sulfur, in the form of sulfur dioxide. You could see the sulfur accumulating behind rocks (rocks that were tossed out of the crater in the 1924 eruption, by the way), and you could certainly smell sulfur in the air. The sulfer makes for a concentrated acid rain, which is one reason why there is little plant life near the caldera.